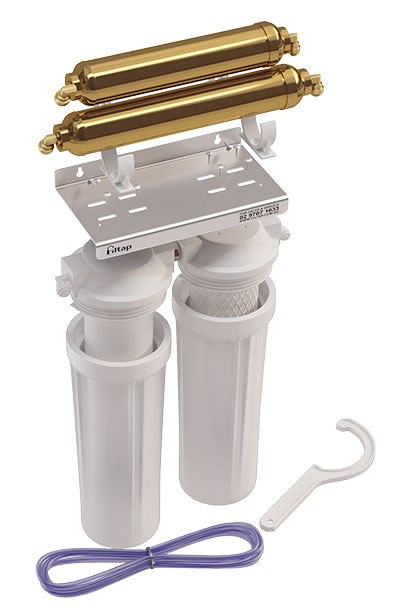 The Quattro Gold alkalising filter cartridges can be added to your pre-built water filtration systems. They work just as well in-line with an existing system as they can work on their own. These are different to other types of filters, as their focus is not just on removing ‘impurities’ from the water (sometimes traditional water filters also remove beneficial mineral and elements as well as all the bad stuff). At a simple level they do this quite well, but what they specialise in, is to change the chemical acidity of the water to make it more alkaline. pH is a term you’ll hear a lot when discussing alkalising water filters. It is a scientific scale used to measure the acidity/alkalinity of a liquid. Pure water is pH neutral. It has a pH level of 7 (on a scale of 0-14). With a pH higher than 7 the liquids become more alkaline, and below 7 the liquids become more acidic. For example, a lemon – being very acidic – has a pH of 2, and ammonia & many cleaning products have an extremely high pH of 11-13. Slightly acidic drinking water might have a pH of 6. Alkaline filters will purify your water & increase the pH level towards neutral, making it less acidic. This chemical transformation improves antioxidising and oxygenating qualities. You can taste the difference. pH neutral water tastes ‘fresher’. It is more satisfying to drink as it is relatively Oxygen rich, and has an equally lower relative amount of Hydrogen. At a molecular level, the filter emits far-infrared rays. This induces shorter cluster chains in the water molecules, which – when drunk – increases the bio-available response and oxygen absorption in the body, providing you with enhanced water that is alkaline, re-mineralised, energised, has low ORP, and one of the best absorption rates possible. This cutting edge filter is the result of much research and experience in the clean water industry. Normally installed under the kitchen sink with a disk tap and carafe-filler spout mounted into the sink (all parts and accessories are included), the system provides an ideal water filter for your home or office. At Filtap™, we are all about turning ordinary tap water into a safe, great-tasting drink. We stay up to date with the latest research, new technologies and the highest quality materials when designing our products. Contact us today about the Quattro Alkaline Filter and drink better tasting, healthier water.